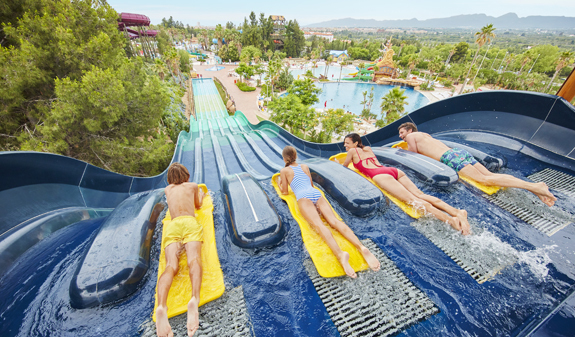 Vast pools, waterfalls and thrilling rides are waiting for you at the water park with Europe's highest slide. Come and spend an amazing day out at the Costa Caribe Aquatic Park, where you'll find attractions for all ages and tastes. 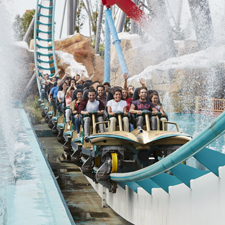 When the hot summer weather arrives there's no better way to cool off than with your friends and family on the water rides in the Costa Caribe Aquatic Park! 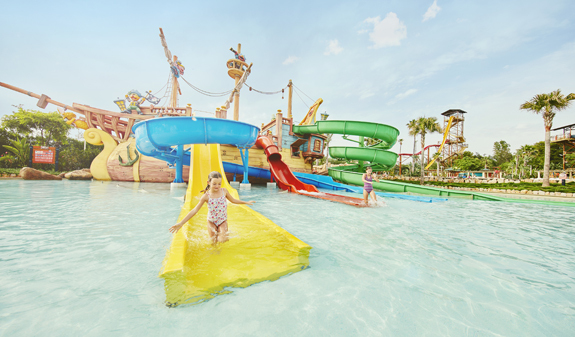 A green space with a spectacular themed attraction: a huge pirate ship with the characters from Sesame Street and loads of slides you can come down at the speed of lightning. 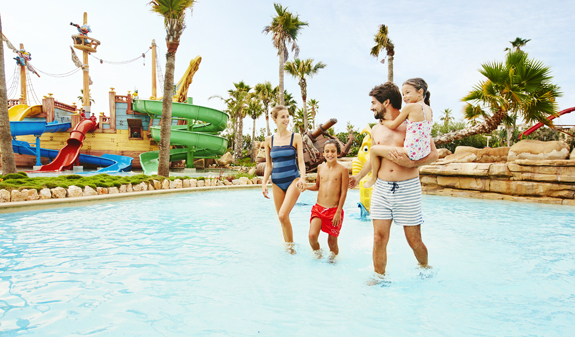 Fun is guaranteed for all ages at this amazing park, close to the Costa Dorada, where you'll also find rest areas and extensive green spaces with more than 50 species of palm trees and Mediterranean plants. You'll board the air-conditioned bus from Barcelona early in the morning and reach your destination in an hour and a half. 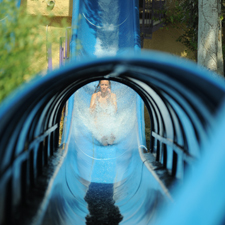 When the park opens you'll be ready for action, racing in the six-lane pools, zooming down the hair-raising Tropical Cyclone and if you really want to test your mettle, you could always try the star attraction, the King Khajuna, the 31-metre free fall slide, the equivalent of 12 storeys! Are you up for it?. Round trip from Barcelona in an air-conditioned bus. Entrance to the aquatic park. From 4/6 to 21/6 and from 8/9 to 15/9: departure of the bus back to Barcelona: 7.30pm. Estimated arrival: 9pm. From 22/6 to 7/9 departure of the bus back to Barcelona: 8pm. Estimated arrival: 9.30pm. From 1st to 16th June and from 4th to 15th September the Aquatic Park closes at 6pm (except from the 17th June to the 3rd September, that closes at 7pm). Meeting point: Julià Travel office c/ Balmes, 5. Metro: L1 and L2, Universitat stop or L1 and L3, Catalunya stop. Bus: 14 and 59. FGC, Catalunya stop. Please arrive at the meeting point at least 10 minutes before departure. 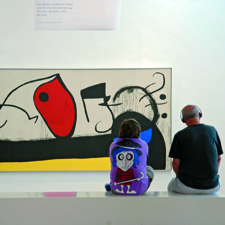 Reduced entrance: children 4 to 10 years and older than 60 years. The service doesn't include a tourist guide or meals.